Walks and climbs are popular with visitors, but local guides are essential once you leave the settlement plain. Other activities include boat trips to Nightingale, fishing and golf. 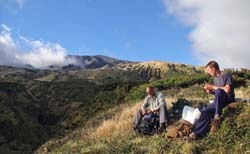 Tristan da Cunha has a range of activities and excursions that can be planned for individuals and groups featuring a personal and bespoke service using experienced Islanders as guides. Prior permission is required for any fishing activities in Tristan waters. Applications to permit recreational fishing by passengers or crew during the period of the vessel’s visit should be submitted to Head of Natural Resources Department. Licences issued will be subject to certain conditions which must be strictly observed. A licence fee of £50 will be charged for visiting cruise ships. The Tourism Co-Ordinator can arrange a golf package, including golf tie, golf certificate, score card and a play on the course for £20. Local vehicles and drivers are available for hire at passengers’ risk for trips between the Settlement and the Patches. (No insurance is available to permit self-drive hire). The current charge for a return trip is £5 per passenger. Weather conditions permitting, local boats are available for hire for offshore fishing, or for trips around Tristan or to Nightingale Island. The walk to the Patches takes about 30 minutes along a tarmac road. 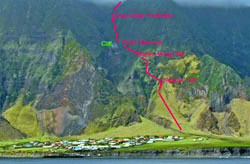 A walk, with a local guide, to the summit of the 1961 volcano also takes about 30 minutes. A climb to the Base, or to the Peak must be arranged in advance with the Tourism Co-ordinator. 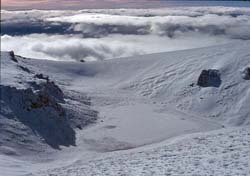 Jeff Shea arranged a climb from the Settlement to the top of Queen Mary's Peak on 17th March 2006. < Jeff's photo. of the route up the cliffs behind the Settlement. For their own health and safety, and for wildlife conservation reasons, visitors must be accompanied by a local guide for any trips on Tristan away from the Settlement/Patches area, or for landings on, or zodiac trips around, the other Islands. Current guide fees are based on fees for guides and divided by the number in any party. These Rockhopper Penguins are pictured as they group waiting to return to sea after their annual moulting in January. They are able to leap onto and 'hop' up the sheer and smooth rocks on Nightingale Island, but even Rockhoppers probably prefer a sandy beach for an easier landing. A possible visit to Nightingale, or seeing Rockhoppers on Tristan will be a highlight of a well-planned trip to Tristan da Cunha. Vessels wishing to land passengers at Nightingale Island, or to conduct Zodiac trips around Nightingale or Inaccessible, must first call at Tristan to obtain clearance and embark local guides at ratio of one guide to 8 participating passengers. In the case of landings, each guide will be in charge of a landing party. The Visits Liaison Officer or nominee aboard the vessel will act as operations co-ordinator and advise on whether the proposed activities should proceed depending on weather or sea conditions. If cancelled for any reason, each guide is to receive a payment of £20 to compensate for loss of earnings. Guides must be returned to Tristan before nightfall.